As digital marketing experts, our job is to ensure that our clients are seen in the right place, by the right person, at the right time. Whether it’s a targeted ad campaign or an effective long-term organic search strategy, our teams tactically design effective campaigns to add real, tangible value to our client’s businesses. In this article, we want to dive into Google’s Ad platform and talk about an often overlooked opportunity that can help local businesses take their results to the next level. Google maps ads! 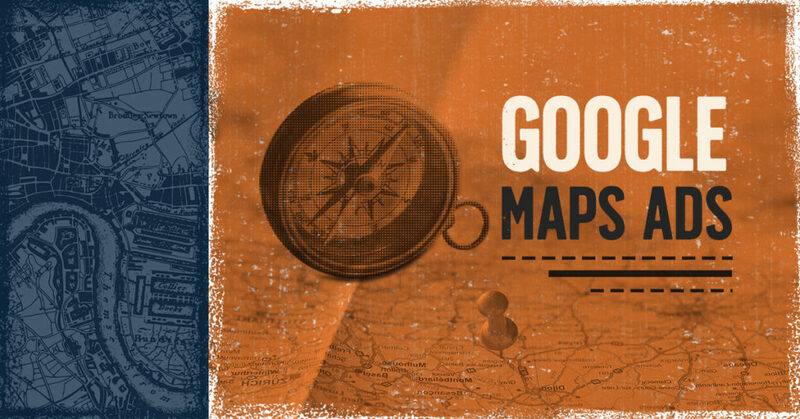 What Are Google Maps Ads? When most people think of advertising with Google, they envision a search ad at the top of the search results page (SERP) or an image ad that follows them around the web (often times without mercy). While both of these ad types are still critical to ensure you have a well rounded approach to acquiring new customers, there’s another advertising opportunity on the SERP that often gets overlooked. In the image below, you’ll notice the familiar map pack that is shown on every search results page when performing a local search. You’ll notice that there are 4 businesses showing instead of the traditional 3 businesses. You may also notice the small green ‘Ad’ icon in the first listing. This is what a Google Maps Ad looks like. Not only does this business get to be shown next to the top results in the area, the very FIRST position is given to the ad! You can see how this is an incredible opportunity to get additional real estate on the results page in a key position. There are a few quick steps that an advertiser can take to give their business a chance to show up in this coveted spot. 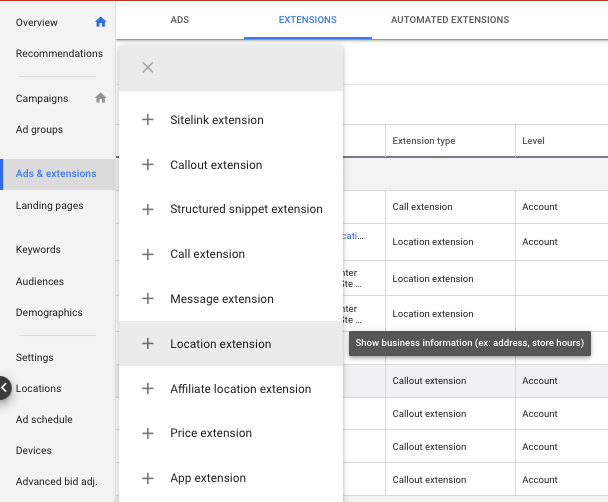 In order to connect GMB to Google Ads, you will need access to the emails used for each account. To start, log into Google My Business account and select the ‘Settings’ tab on the left hand side of the screen. There will be a ‘preferred email’ setting. If this email is the same email you use for Google Ads, then you’re ready to move on to step 2. If it’s not, you’ll need to grant admin access from your Google Ads account for the email associated with your GMB listing. Ad extensions are the snippets of information that display below a search ad on Google. Sometimes a searcher will be shown a snippet that has the location of the business. This is a location extension. The image below illustrates how to access location extensions. If you’re not targeting a town or city in your campaigns, you won’t be eligible to show up in the maps ad position. 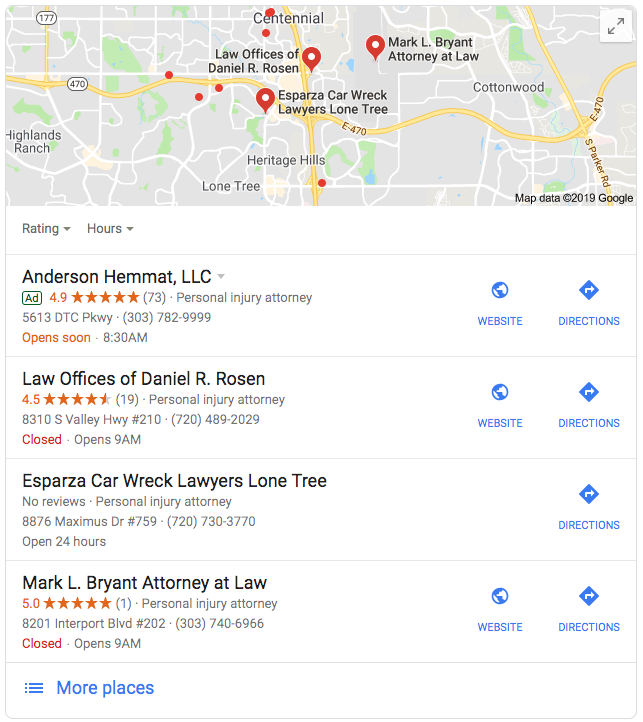 If you’re targeting injury law searches in Denver, then ensure that you’re bidding on keywords that include the city name in them, or even specific towns such as ‘Cherry Creek’ (a suburb of Denver). The more targeted your campaigns are, the higher the likelihood that your brand will have the opportunity to show up as a map ad. The last step is tracking! There are so many advertisers that I see miss this crucial last step that will help you track the ROI and effectiveness of these ads. While using a unique tracking number may not be a feasible solution for every advertiser, we recommend creating a tracking number to show with these specific ads. Adding a tracking number is an easy process. Once you have your unique tracking number, navigate over to your Google My Business dashboard and select the ‘Info’ option in the left hand menu. You’ll come to a page where you can edit all details about your business listing. 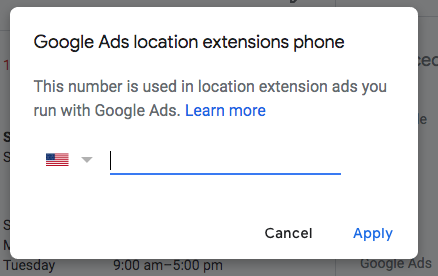 On the right hand side of the screen you’ll notice an option to add a ‘Google Ads Location Extensions Phone’. This is where you’ll place this tracking number. Don’t worry, it won’t have an effect on the NAP (Name, Address, Phone Number) consistency for your business in Google’s eyes! That’s it! You’ve done it! Now, that doesn’t mean that the fun ends there. You’ll need to test, measure, and repeat to get to a point where you’re reaping the full benefits of maps ads. A successful ad campaign doesn’t happen overnight and doesn’t perform to it’s potential on day one. Put in the time to optimize your keyword and location targeting day in and day out. As always, our team of search marketing experts at Clicks & Clients is here to add insight however we can!